Bedford Stuyvesant Restoration set out to show how bike-share can help neighborhood residents, and it's making an impact. 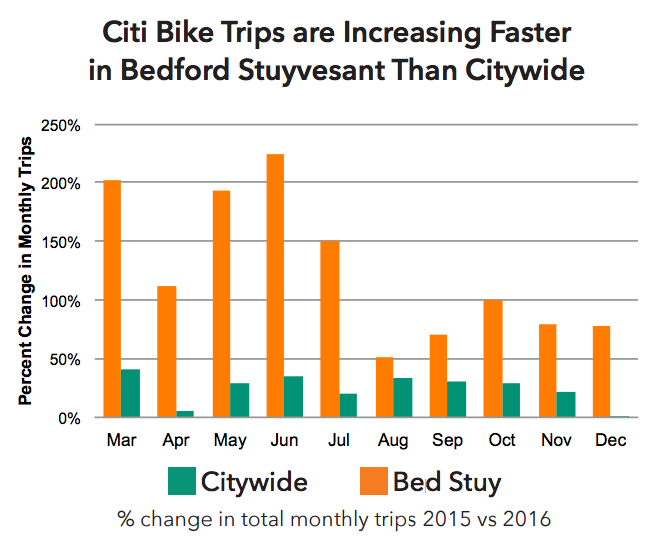 The growth in bike-share ridership in Bedford-Stuyvesant is outpacing the rest of the city following a multi-year community organizing effort, according to a report released today by the Bedford Stuyvesant Restoration Corporation [PDF]. Bed-Stuy was one of the few majority-black and lower-income neighborhoods in the bike-share network’s original 2013 service area. But many residents didn’t see the bikes as intended for them, and ridership lagged behind the rest of the system. 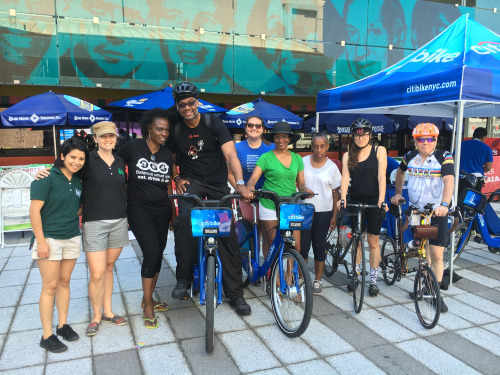 So Bed-Stuy Restoration, the nation’s oldest community development corporation, started the Bed-Stuy Better Bike Share Partnership with NYC DOT, the Department of Health, and Citi Bike operator Motivate. The Partnership began with an intercept survey (talking to people on the street) in the summer of 2015 to assess why neighborhood residents weren’t signing up. The results showed that while 36 percent of neighborhood residents rode a bike at least a few times a year, only 18 percent had ever used Citi Bike. Respondents cited the lack of bike-share coverage and safe conditions for bicycling as deterrents. In addition, longtime residents perceived bike-share as intended for more affluent, white residents who’d arrived more recently: 32 percent of respondents said they thought the service was not “intended for people like me,” and 35 percent said they would be more likely to ride bike-share if they “saw other people like me” also using it. In 2015, the number of Citi Bike stations in the neighborhood increased from 10 to 36, and the Better Bike Share Partnership set out to shift public perception of the service. The Better Bike Share Partnership increased the visibility of advertisements and information about discounts for NYCHA residents and credit union members, hosted 84 neighbor-led group rides in 2016 alone, and sold subsidized bulk memberships to local partners to distribute to their staff and members. “Local champions” have been key messengers, according to the NACTO report. Those champions range from high-profile community leaders like Capers and Assembly Member Walter Mosley to local residents who started riding before many of their neighbors. They have lent their names, faces, and time to various outreach efforts. Today, bike-share usage in Bed-Stuy is rising fast. In September, the peak cycling month in New York, there were 70 percent more trips in the neighborhood than the same month in 2015. From March 2015 to December 2016, bike-share membership increased 56 percent in Bed-Stuy, compared to 46 percent as a whole. Among NYCHA residents in the neighborhood, membership also rose faster (more than 500 percent) than among NYCHA residents citywide (less than 300 percent). While bike-share has become a viable and successful new way to get around NYC, it has yet to reach most of the city's low income neighborhoods and communities of color. The program expands the discount available to NYCHA residents, but it would go a lot farther if Citi Bike itself were expanding.